← The greatest animated movie never made? The Twisted Twins Jen and Sylvia Soska. Twisted Twins Productions photo. For a Halloween treat, we asked Jen and Sylvia Soska, the “Twisted Twins” themselves, to select their favourite horror movies of the century so far. What we got back from Vancouver’s darlings of disturbance goes back further, all the way to 1979, but hey, we’re not complaining – we’re just happy the filmmakers took time out from promoting their second movie, American Mary (which, by the way, has been picked up for distribution by Universal) to compile the list. 1. Antichrist (2009) – We’re big fans of Lars Von Trier and this is our very favorite of his films. The struggle between the genders, and science versus religion, man versus woman, and logic versus passion really appeals to us. the performances with the minimal cast of Charlotte Gainsbourg and Willem Dafoe. Just a beautiful work of art. 2. Martyrs (2008) – It’s a smart film made for a clever audience. We went in knowing nothing about it and recommend the same for viewers so we won’t give much away. It’s a rarity in the “laugh track” generation to have a film that forces the audience to make their own interpretations of its meaning. 3. American Psycho (2000) – A brilliant film based on our favorite novel by Bret Easton Ellis. It’s one of the best films ever directed by a woman, Mary Harron, and beautifully blends horror with humor. It’s artful and the narration is wonderfully executed. 4. Audition (1999) – This is another film we knew very little about going in aside from the fact that it is by the legendary Takashi Miike. It has one of our favorite all time female performances in an original and truly dark story. The last fifteen minutes had us screaming at the screen. It was a big inspiration for American Mary. 5. Suicide Club (2001) – We love Rolly Teranishi. His performance as Genesis, his “Suicide Kiss” scene, and the way the film is pulled along by a truly counterpoint soundtrack just made us feel in love with it. It’s not for the faint of heart, though we find it hilarious. 6. Sinister (2012) – I hate found footage films. I had high expectations going in and this film floored us. We saw it at Fantastic Fest and it was our favorite film there. It is a work of genius. There is a wonderful use of humor that you don’t see in the trailers that really made us fall in love with this film. Do yourselves a favor and go see it. 7. I Saw the Devil (2010) – We were pretty much sold on this when it was rated so strongly for content that it was banned in its own country. It’s a piece of art. The cinematography alone makes ever shot worthy of hanging on your wall. 8. 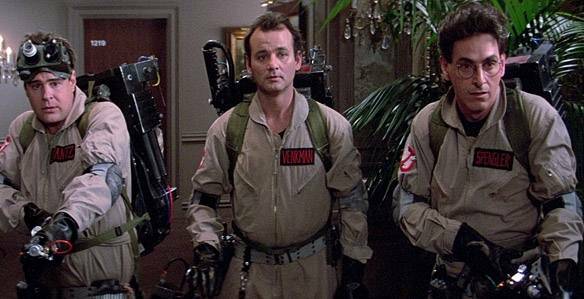 Ghostbusters (1984) – One of our all time favorite films. Though wonderfully comedic, it is also brilliantly shot, executed, and performed. This film easily stands against the test of time. 9. Alien (1979) – The film that is the milestone for the evolution of the final girl. Ellen Ripley is the woman that made us at a young age decide “we want to be her.” Breathtaking HR Giger-inspired designs and a gore~geous Alien creation. Truly the best of the best. 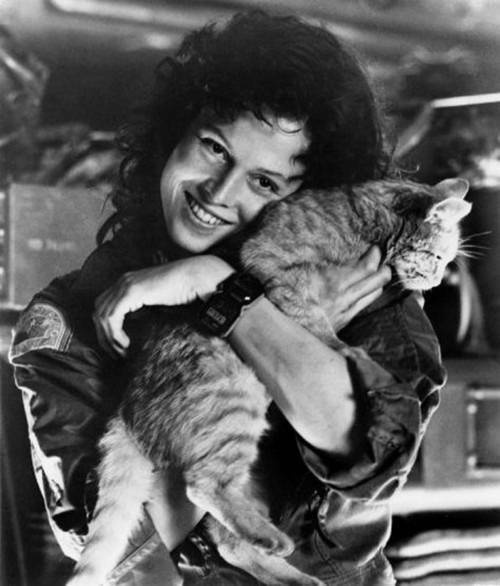 Alien stars Sigourney Weaver and Jones the Cat. 10. Let the Right One In (2008) – One of the most original vampire films we’ve ever seen. Twilight wishes it had a fraction of the heart and art of this film. It’s truly moving and outstanding. Don’t bother with the remake. Always do the original. Subtitles aren’t all that hard to read. This entry was posted in Movies and TV and tagged Charlotte Gainsbourg, horror movies, Lars von Trier, movie lists, Soska twins, Twisted twins, Willem Defoe. Bookmark the permalink.